Richard explains why we still like the momentum style factor even after a recent break in its rally. The momentum style factor — stocks that are trending higher in prices — has outperformed the broader market so far this year. We believe that sustained above-trend economic growth and solid earnings prospects could help extend momentum’s gains, but the road ahead could be bumpy. Momentum has historically outrun the broader market, but with periodic sharp drops. 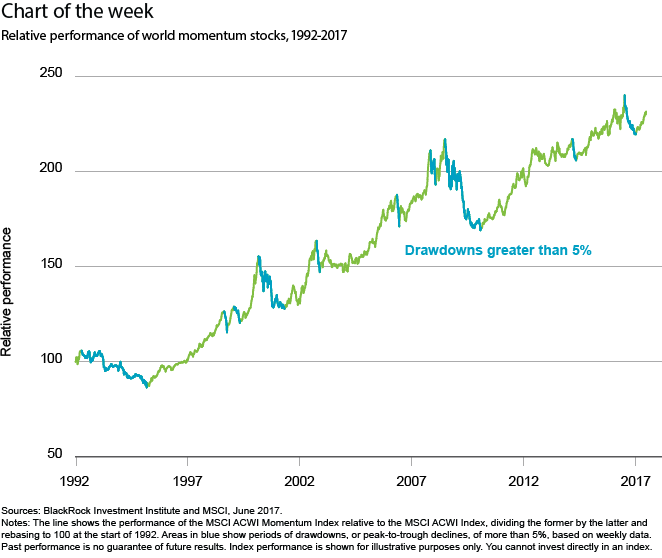 The biggest dips in the performance of the MSCI ACWI Momentum Index relative to the MSCI ACWI Index have mostly coincided with recessions and financial crises, as the chart shows. Our research shows that momentum tends to perform the best during sustained economic expansions. We are in such a phase, and we see this cycle having ample room to run. The technology sector has become the main driver behind momentum recently. The sector has the highest earnings growth forecast in 2017 outside of energy and materials, and technology is increasingly disrupting traditional business models. A sharp drop in tech stocks caused a break in the momentum rally in mid-June. But we believe such episodes shouldn’t spook investors. Momentum drawdowns typically last two months or less, barring major economic or financial shocks, our analysis of market data since 1991 suggests. The momentum factor today includes significant exposure to financials, which can help cushion the downside during any tech selloff. In addition, analysis by BlackRock’s Scientific Active Equity team points to an unusually broad set of macro and fundamental drivers behind the momentum factor. And we don’t see the factor as particularly crowded or expensive. This points to resilience behind the trend. We see the sustained economic expansion keeping us in a low-volatility regime longer than many expect. This bodes well for momentum trades. But a sudden shift in stock leadership as a result of a global growth slowdown, weaker-than-anticipated profits or a spike in bond yields could threaten the rally. Bottom line: We like momentum in today’s economic environment, even if its performance could be prone to short-lived reversals. Originally published at www.blackrockblog.com on June 27, 2017.